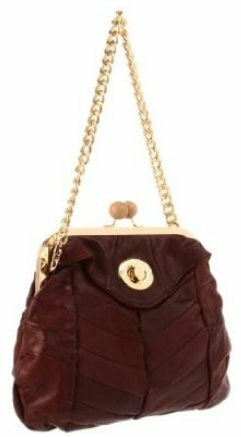 I'm surprised to see 7 Chi creating a bag so conservative, but with retro styling continuing to dominate the catwalks perhaps it's not so much of a stretch. 7 Chi wears this new sedate image well. I love the way the chevron style stitching helps to make the chocolate brown leather more interesting, and the pop of the polished gold hardware. I never expect much from a mini bag, but the Donna certainly exceeded my expectations. The turn-lock closure on the front opens to reveal a convenient external pocket. Inside we find a zippered pocket and three slip pouches, which is more than we get in most large totes! There are also six credit card slots so our wallets need not clutter the already small main compartment. The choice of carrying straps is also impressive. The short one turns the Donna into a shoulder bag, while the long strap makes it a cross-body. Alternatively we can leave them both behind and use the Donna as a classic clutch. It might be small, but the Donna's versatility ensures we see value for our $108. The 7 Chi Mally bag, a modern alternative to this mini bag.